During the Hellenistic era artists around the Mediterranean created innovative, realistic sculptures of physical power and emotional intensity. Bronze—with its reflective surface, tensile strength, and ability to hold the finest details—was employed for dynamic compositions, graphic expressions of age and character, and dazzling displays of the human form. 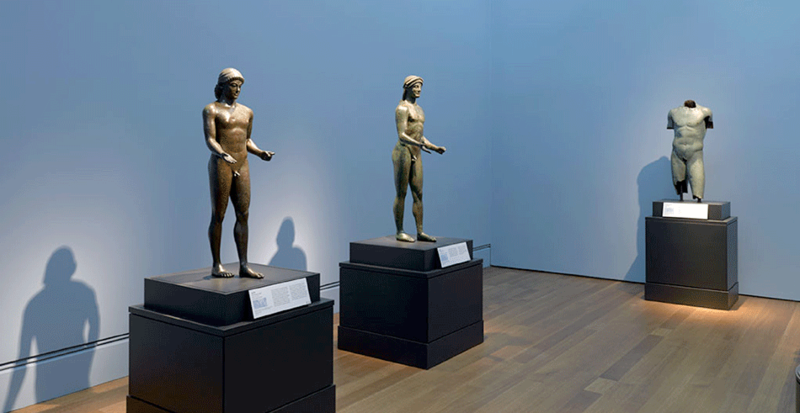 “The representation of the human figure is central to the art of almost all ancient cultures, but nowhere did it have greater importance, or more influence on later art history, than in Greece,” said Timothy Potts, director of the J. Paul Getty Museum. “It was in the Hellenistic period that sculptors pushed to the limit the dramatic effects of billowing drapery, tousled hair, and the astonishingly detailed renderings of veins, wrinkles, tendons, and musculature, making the sculpture of their time the most life-like and emotionally charged ever made, and still one of the highpoints of European art history. 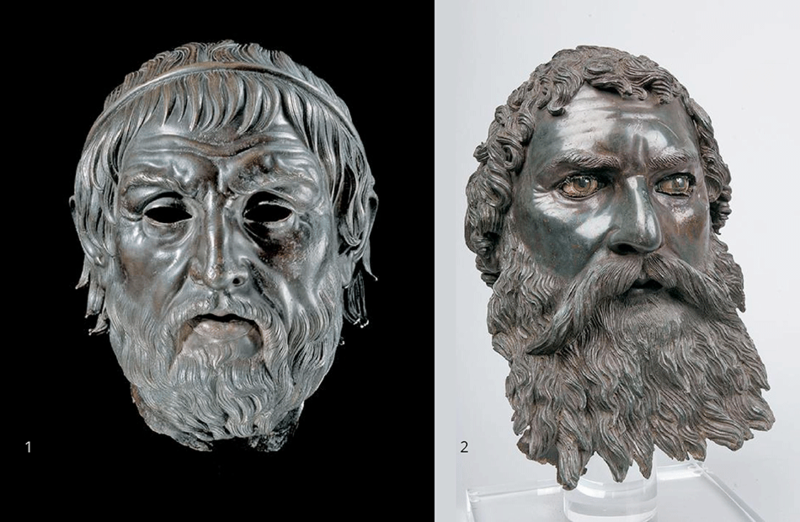 Large-scale bronze sculptures are among the rarest survivors of antiquity; their valuable metal was typically melted and reused. 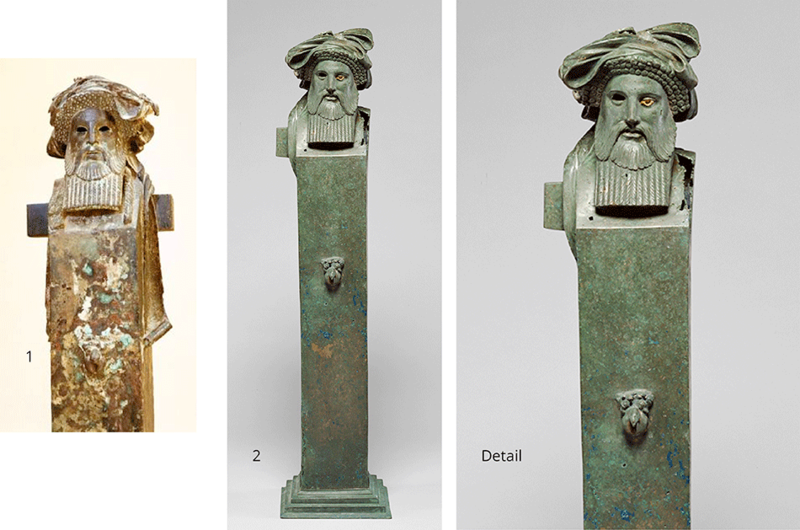 Rows of empty pedestals still seen at many ancient sites are a stark testimony to the bygone ubiquity of bronze statuary in the Hellenistic era. Ironically, many bronzes known today still exist because they were once lost at sea, only to be recovered centuries later. 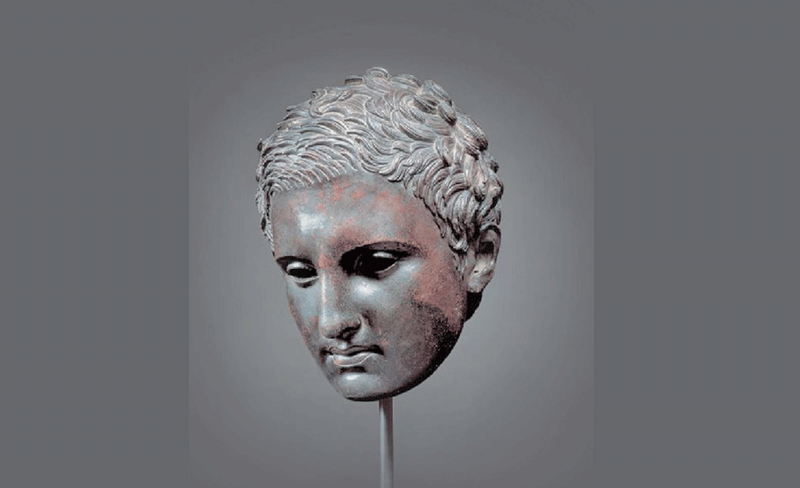 Power and Pathos: Bronze Sculpture of the Hellenistic World is especially remarkable for bringing together rare works of art that are usually exhibited in isolation. 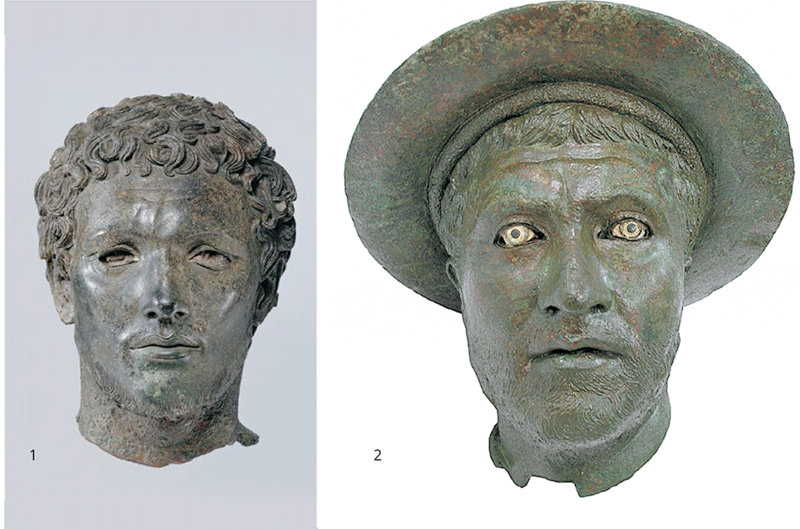 When viewed in proximity to one another, the variety of styles and techniques employed by ancient sculptors is emphasized to greater effect, as are the varying functions and histories of the bronze sculptures. 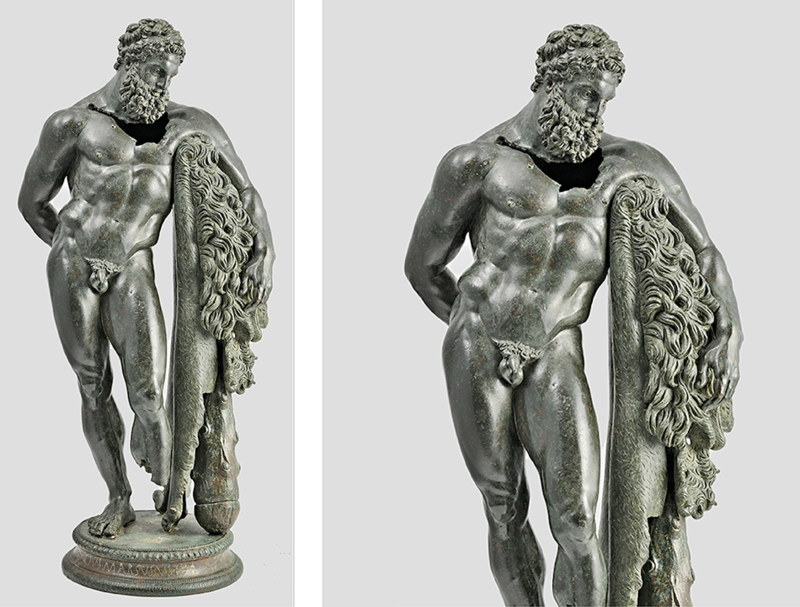 Bronze, cast in molds, was a material well-suited to reproduction, and the exhibition provides an unprecedented opportunity to see objects of the same type, and even from the same workshop together for the first time. 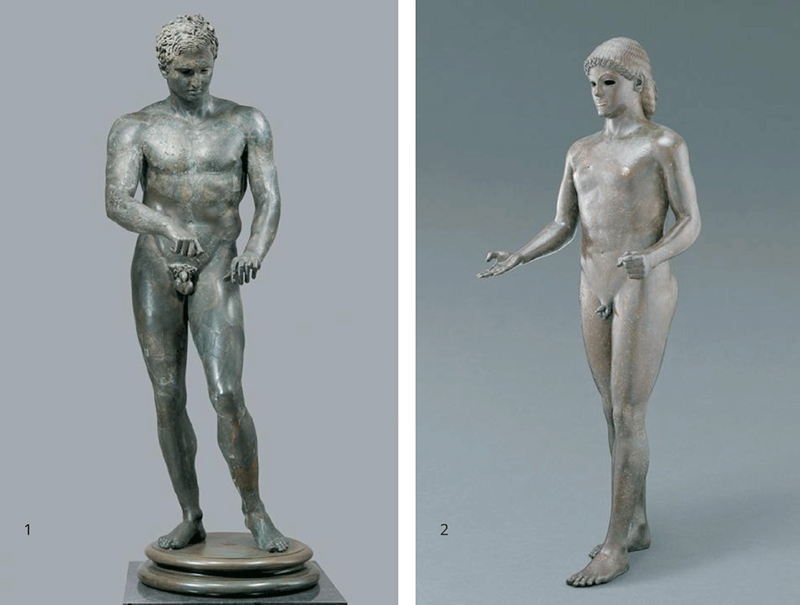 For example, two Herms of Dionysos – the Mahdia Herm from the Bardo National Museum, Tunisia and the Getty Herm were made in the same workshop and have not been shown together since antiquity. Among the many famous works is the so-called “Head of a Man from Delos” from the National Museum of Athens, a compellingly expressive portrait with well-preserved inlaid eyes. The dramatic image of an unknown sitter is believed to date from the end of the second or beginning of the first century BC. 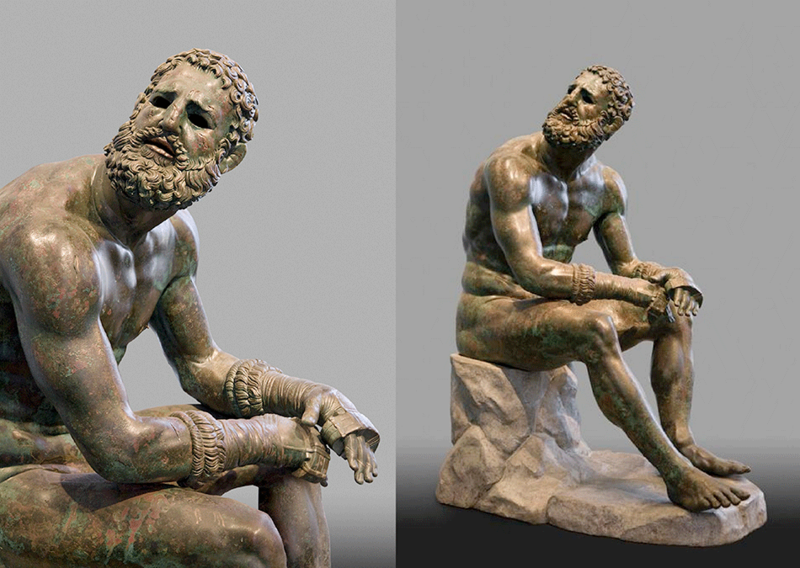 The iconic “Terme Boxer” on loan from the National Roman Museum, with its realistic scars and bruises, stands out as the epitome of the modern understanding of Hellenistic art, employing minute detail and an emphatic, arresting subject. 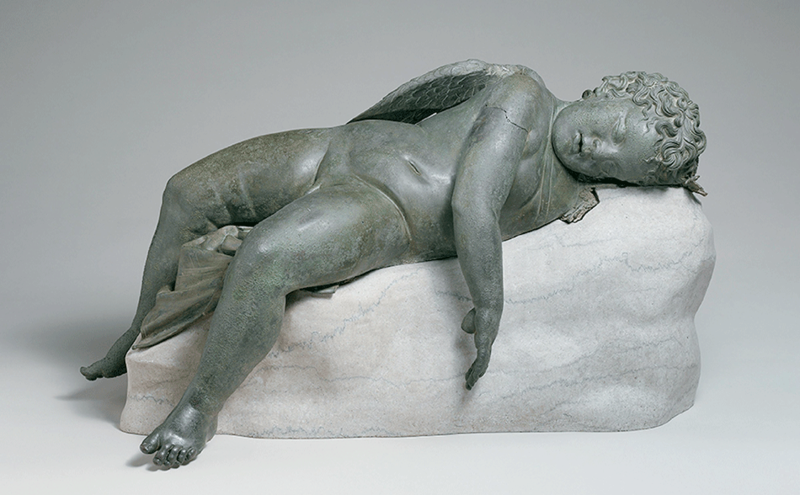 The weary fighter, slumped and exhausted after his brutal competition, combines the power and pathos that is unique to Hellenistic sculpture. Although rarely surviving today, multiple versions of the same work were the norm in antiquity. 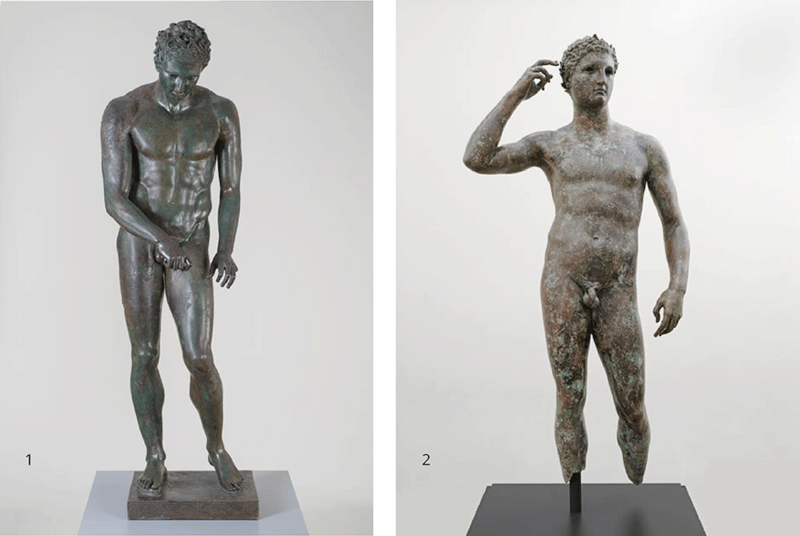 A good example is the figure of an athlete shown holding a strigil, a curved blade used to scrape oil and dirt off the skin, known in Greek as the apoxyomenos or “scraper”. 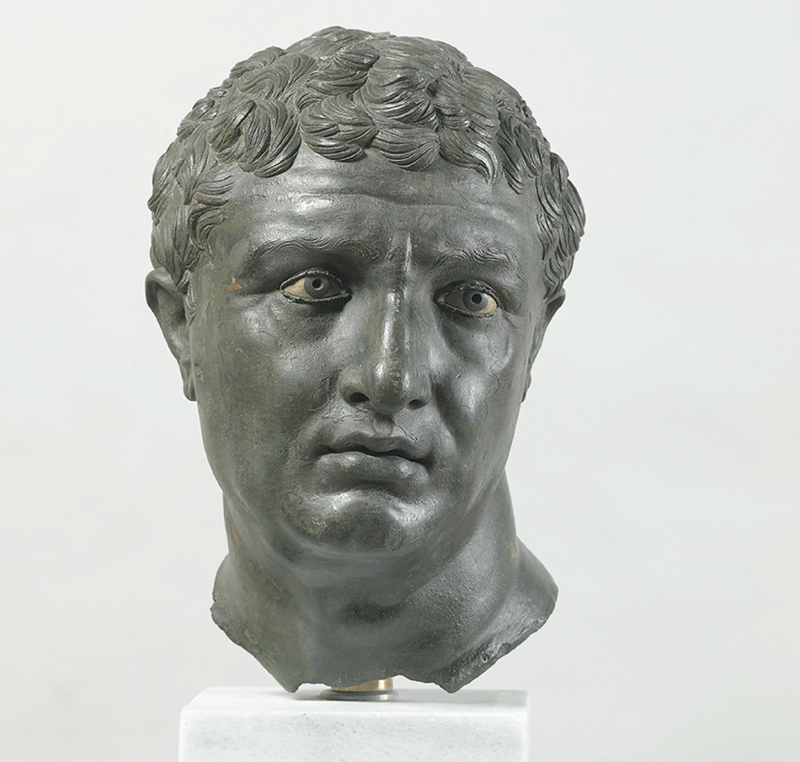 This exhibition brings together three bronze casts—two full statues and a head—that are late Hellenistic or early Roman Imperial versions of a statue created in the 300s BC by a leading sculptor of the time. This was obviously one of the most famous works of its time and copies were made well into the Roman Imperial period. Opening Times: Monday through Saturday from 10:00 a.m. to 5:00 p.m.
and Sunday from 11:00 a.m. to 6:00 p.m. The Gallery is closed on December 25 and January 1. 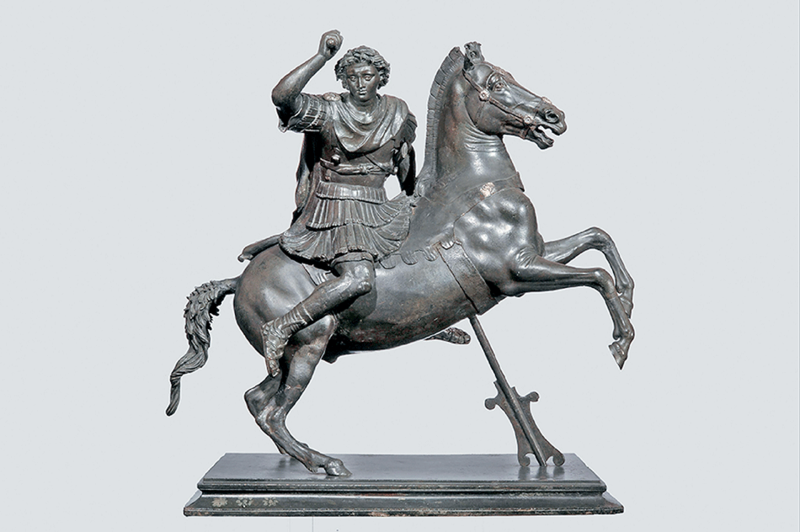 * The exhibition Power and Pathos: Bronze Sculpture of the Hellenistic World was organized by the J. Paul Getty Museum, the Fondazione Palazzo Strozzi in Florence, and the National Gallery of Art in Washington with the participation of the Soprintendenza per i Beni Archeologici della Toscana. 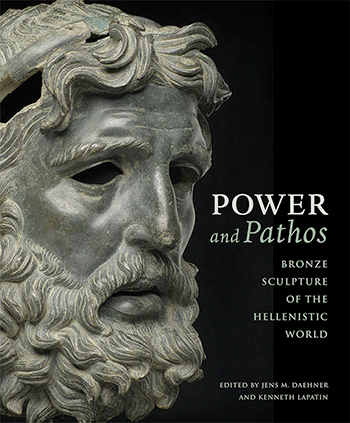 The exhibition is accompanied by a publication, also titled Power and Pathos: Bronze Sculpture of the Hellenistic World, edited by Daehner and Lapatin. 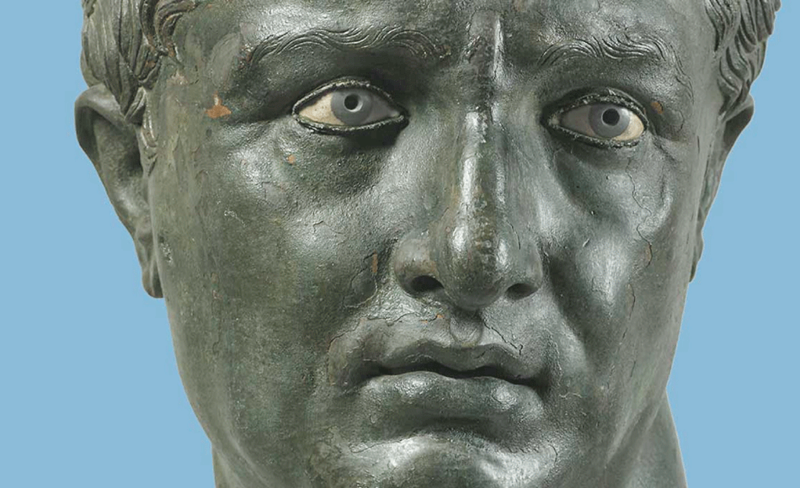 The richly illustrated book is the first comprehensive volume on large-scale Hellenistic bronze statuary and includes significant new research in archaeological, art-historical, and scientific essays. Published by Getty Publications, it is designed to be the standard reference on the subject. Bank of America is the National Sponsor of this touring exhibition. The exhibition is also made possible through a generous gift from an anonymous donor. the Fund for the International Exchange of Art. * The Los Angeles presentation was supported by the Getty Museum’s Villa Council, Vera R. Campbell Foundation, and the A. G. Leventis Foundation.